As those of you who manage multiple WordPress sites know, managing them all and dealing with each individual site’s plugins, themes, core and translations can be a time consuming and difficult task. But now, we are thrilled to announce the launch of a service that will take all the hassle and work out of managing your sites. It’s called Easy Updates Manager Premium – It has been specially designed and created for those that want to make quick and easy work of checking for updates and making changes across multiple websites; and we are sure you are going to love it. With Easy Updates Manager Premium there is no need to login to each individual site and check for updates or make each individual change manually. This plugin takes care of that and does all the time consuming and difficult work for you. Simply add your site and plugin details and “set and forget” to receive automatic updates. 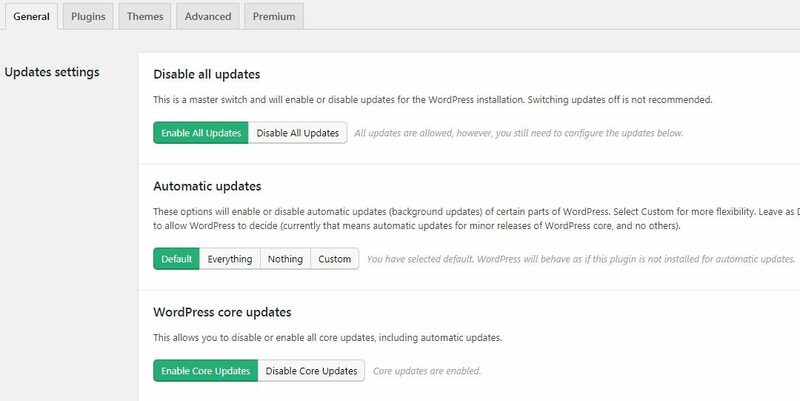 You can also personally customise your updates on each individual aspect of WordPress core with multiple settings option; making managing your WordPress update settings quick and easy. With all these options available for configuration, Easy Updates Manager Premium gives you complete control of how, when and what and what not to update. We have all been in a situation where you download an update, only to instantly regret it. If you feel that an update or change caused unexpected errors or other issues, you can access the Easy Updates Manager Premium update log and check the version that caused the problem and rollback the update or change, restoring your site to an earlier version. Easy Updates Manager Premium also allows you to have full control over safe updates, schedule updates, external logging, email notification of updates and access to premium support as well as many other features. Premium will help you take all the work out of keeping your site’s plugins, themes, core and translations up to date. We have no doubt that once you have used our new service, you’ll appreciate just how much help it really is. Easy Updates Manager is available for download here here. The post Easy Updates Manager announce new Premium release appeared first on UpdraftPlus. UpdraftPlus – Backup, restore and migration plugin for WordPress.